Have you considered complementing your doll collection with picture postcards? There are thousands of designs available, and as they take up so little room, you won’t get guilt feelings each time you buy another. Picture postcards became popular in the 1890s, reaching their peak in the early 1900s, up to the end of the first world war, but even today, millions of cards are sent each year. In the days before telephones were commonplace, a postcard was the ideal medium for sending a quick message, and in Britain it was possible to post a card in the morning inviting a friend to tea the same day, and they would receive the message in plenty of time. Today, of course, it can take several days for a card to reach its destination, and so the cakes would turn stale and the tea grow cold and stewed before the invitation reached your friend. Cards served the same purpose for which we now use the phone, text message or email; they enabled people to keep in touch by brief communications. 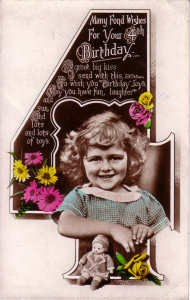 Nowadays we mainly tend to send picture postcards when we are on holiday, but at one time they were used for many different purposes including birthday, Easter and Christmas greetings – it wasn’t until the late 1940s that the folded greetings card became the norm. As you form your collection, you will no doubt discover that the majority of dolly cards you accumulate are of the greetings type. They’ve been so naughty all today. If I would teach them how to pray. She breaks if Mother bends her knee. 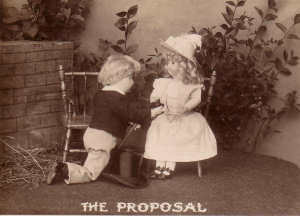 Many of the cards are photographs, usually sepia in tone, and, as well as being attractive, are particularly important to doll collectors because they make it possible to identify the doll depicted; something which can’t generally be done with any degree of certainty in a drawing. 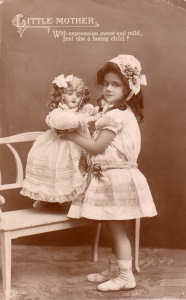 Extra interest can be added to a display when a doll is seated next to a postcard depicting the same kind of doll, especially if you dress your example in similar style to the doll shown on the card. Postcards can serve a practical purpose too. They are a visual guide to the types of dolls and the clothes they wore, as well as a guide to the fashions in children’s wear. Many of the boys depicted on the cards appear far older than their years due to their style of dress – thick formal jackets, long trousers, waistcoats and high collars. Some of the dresses worn by the little girls are delightful, with plenty of frothy lace and frills. No doubt today’s modern tot would turn her nose up in disdain if she was made to wear such a garment, which is why it’s fun to find modern examples showing 2000’s children with their dolls to add to your collection. It isn’t easy, though! However, a good start is to look through modern holiday postcards in the hope that a child and her doll was playing on the beach or walking along the prom when the photo was taken. Postcards can also be used as provenance – if the cards are dated, postmarked or stamped, it means that the doll shown on the front can be authenticated – it could be earlier than the date on the card, but will never be later. 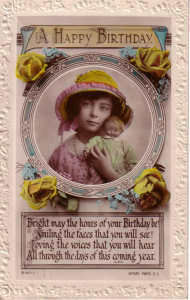 For example, if you had been told that a certain type of doll was not issued until 1927, but you come across a postcard featuring that doll and bearing a stamp franked with a postmark of two years before, you can be certain that the doll must have been made in 1925 at the latest – and maybe before. 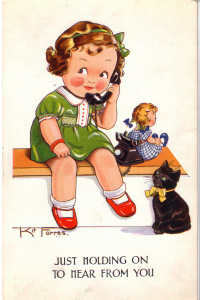 Cards add to our knowledge as well as providing a slice of social history; when telephones became more popular during the 1930s and 40s, they featured alongside dolls, as did motorcars, radios and televisions. 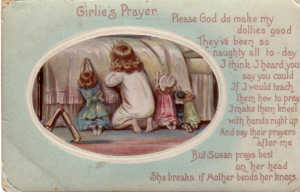 A slightly different, but important, genre, are those postcards sold at doll museums and exhibitions which are basically straight depictions of dolls without flowery trimmings, pretty children, kittens or roses. These are useful as identification aids. Frequently, messages on the backs of the cards make interesting reading, even though you do get a feeling of eavesdropping. Early holiday cards often say that the sender is ‘having a grand time'; but later, ‘grand’ is substituted by the more modern term ‘lovely’. Some people didn’t like the thought of the postman reading their private mail, so they wrote the messages upside-down. Others alternated the lines of writing, wrote crossways or even used a code. At first, postcards cost a halfpenny (in old money) to send inland, which rose in 1918 to a penny. In 1940 it was doubled. Now of course, it costs 23p to send a postcard (2nd class delivery). It is amusing to see the oh-so-casual way which children treat their dolls on the cards, especially when you realise that the doll depicted is now classed as a collector’s item, not a toy! It puts doll-collecting in perspective, a reminder that all these dolls, even the rarest and loveliest, were once toys. As the majority of dolls at the time were made from breakable bisque, or maybe composition, it’s surprising that so many have survived to enchant collectors today. Of course, often the dolls shown in the photos didn’t belong to the child, they were photographer’s props, but even so, the children seem to have been allowed to play with them quite naturally so that the photographer could get the photo he wanted. Photo post cards featuring children and their toys were still in use after the second world war, during the late forties and early fifties. The dolls shown in the later photographs are, very occasionally, plastic, but bisque, cloth, celluloid or composition are much more commonly found. Incidentally, it is not only beautiful dolls which are featured on the cards, many are homely or even ugly, while often they have unkempt hair or are dr essed in a strange mishmash of clothing. Whether you store your them in a shoebox, keep them in in albums or display them alongside your dolls, postcards help to bring your doll collection to life by giving them a human touch.